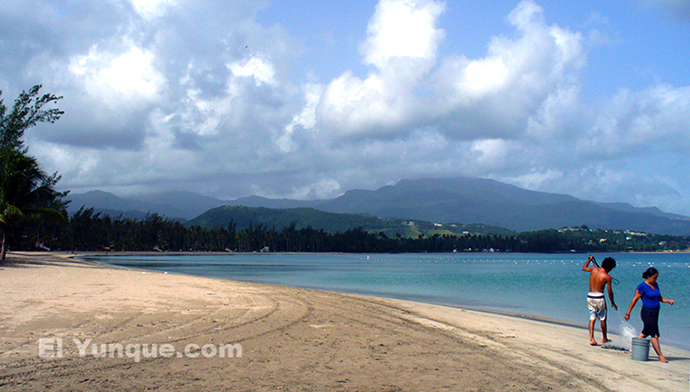 Beaches line the town of Luquillo, this is one of Luquillos' many and varied beaches.. This beach, Playa Azul, is a good one for body surfing, the waves are often perfect for that. Surfers stay by 'La Pared' ( to the right of this photo) and don't bother here. The Balneario Monserate is a public beach with facilities, parking and an entrance fee. A beautiful long beach with calm protected water. You can walk here from the far western part of the town. Icacos Key ( Cayo) a few sandy offshore keys just east of Fajardo. Can only be reached by boat. The waters are really this clear and turquoise! You can get a 'water taxi' from the cement dock in Las Croabas, Fajardo. Water Taxi service to and from Icacos is available. Please do not bring plastic bags, cups etc. to the beach! If you have no other option, please check that you have taken them all back with you (plus a few) to be disposed of properly. The animals in the sea are dying from eating all the plastic humans dump in the ocean! Thank you. Be kind to the sea! Balnearios ( public beach family recreational facilities). 'Parques Nationales de Puerto Rico' now administers the Balnearios. Most offer changing facilities ( privatized parking). Some have camping facilities, some have cabins and villas.
. . . and in the mountains of Maricao - Cabins Tel. 787-622-5200 for information for ALL. Sun Bay Balneario Campground in Vieques. Tel. 787-741-8198. OK for safety but lots of petty theft. ACC Autoridad de Conservacion y Desarollo de Culebra administers the Flamenco Beach campgrounds on Culebra Island. Fee. Good for safety, facilities and the most beautiful beach. They usually accept walk in reservations in the winter months. Summer, especially summer weekends, are zoo-like. It is not recommendable to camp here during summer weekends, you probably won't even be able to get on the ferry. you do need advance reservations. Tel. 787-742-0700 or write: Attn: Playa Flamenco, P.O.Box 217, Culebra, Puerto Rico 00775 USA. Schools of Blue Tang are the most common, mainly because they are not a popular fish to eat! Good snorkeling is usually found a little distance from the beach. The reefs in the Cordillera Reserve, Vieques, Culebra, La Parguera, Mona Island etc. are the most pristine. There are endless corals offshore, the trick is finding them! 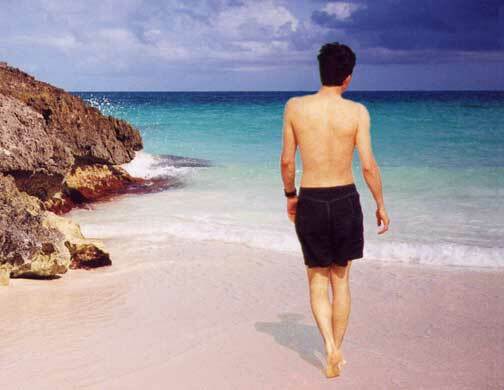 The Islands of Culebra and Vieques are more like the Virgin Islands than Puerto Rico. They receive less rainfall and have no rivers that deposit sediment into the ocean . The reefs are more abundant and the waters clearer. If your priority is endless pristine beautiful beaches then head for Vieques and Culebra Islands but you will need to rent a jeep to see them all. Ferries leave from Ceiba to either island but not between the two islands. 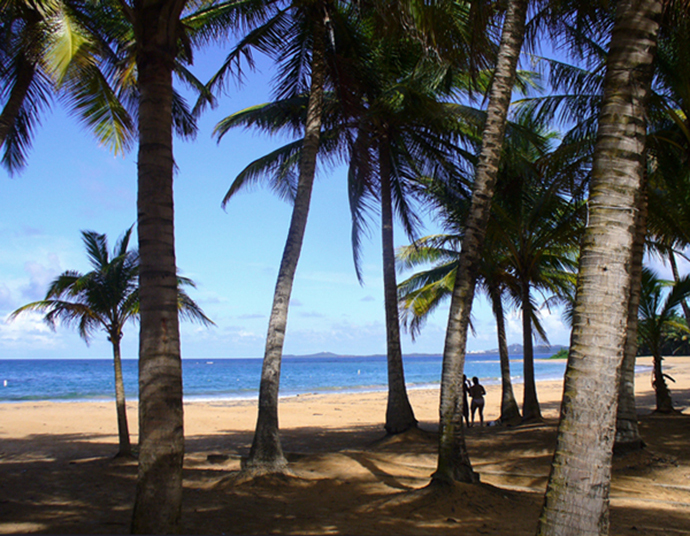 Photo below: Navio beach on Vieques, on a calm day. 'Punta Arenas' is at the west end of this beach. This is on the Western US Fish & Wildlife Reserve. A fabulous beach in many ways, but the 'mimis' come out after 4 PM ( or cloudy rainy days) and the reserve closes at 6 PM or so... so, no sunset watching here!